7,000 lbs capacity per pair. 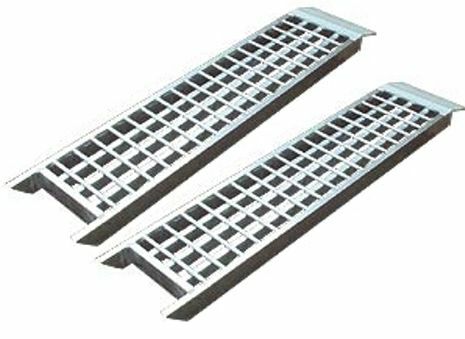 Bridging ramps sold in pairs. 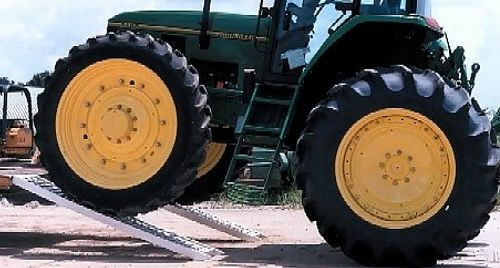 Serrated cross bars provide traction. 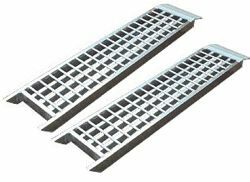 Shipped 'ground' in the continental U.S.
Each ramp is 60" L x 14" W.
Our U.S. Made mega-sturdy vehicle bridging ramps provide effortless and safe handling. Designed to load vehicles onto flatbed trailers, they can be used in any situation where a ramp that supports a vehicle's weight is needed. Made of aluminum, they won't rust, are light enough to carry and handle, yet still provide the maximum in strength and durability. We were asked if they would support the weight of a 4X4...you think? . HD ex-military pierced steel plating (PSP). Each ladder is 60" x 16" and weighs 25 lbs. For vehicle recovery from mud, snow, sand and most types of soft terrain. . Relocate your engine’s air intake point from its stock position to a much higher and safer location for a constant source of cool, clean air. .
Cleans air before it reaches the filter! Maintains effective engine breathing for maximum efficiency and power. .